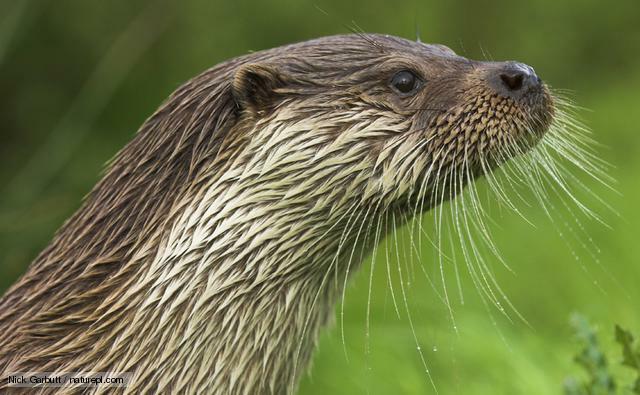 There are about 13 species of Otter. Are a member of the Weasel family. There are sea otters and land otters. Eats fish, amphibians, birds, shellfish, crayfish, salamanders, frogs, clams and small mammals. Are playful, intelligent and inquisitive - enjoying sliding down the riverbanks, wrestling with each other and somersaulting. Live in burrows along riverbank. They eat, sleep and give birth in the water. They use rocks to crack open mussels. Like to float on their backs on the surface of the water. Can stay underwater for up to 4 minutes. As they dive, they close their ears and nostrils to keep the water out. Main threat is water pollution and habitat destruction. Sea otters hold each other's paws when they sleep so that they won't drift apart. The body of sea otters has a pouch across the front in which it stores pebbles to break open shellfish. Newborn otters done know how to swim, so their parents drag them into the water to teach them.